A bright new guidebook to Resolis, the Black Isle parish is packed with information, the text of the 140 page book is supplemented by more than 70 photographs. The settlements of Resolis are well known, several such as Jemimaville, Cullicudden and Poyntzfield being very distinctively named, but few are aware that Resolis takes in seven miles of the Black Isle coastline. It is a big parish, and has had an eventful history, with political squabbles, murders and mass riots. The author, local historian Dr Jim Mackay, has led popular guided tours of areas of Resolis for many years now. This is a book for those people who really want to know more about where they live, the outstanding buildings in the area such as Castle Craig, the stories behind the places, the characters, how ordinary people lived and died. 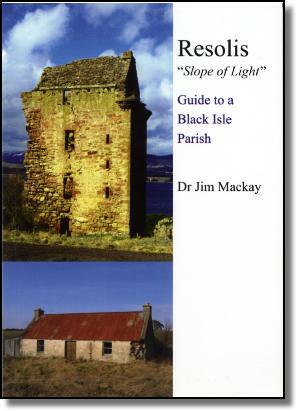 Entitled 'Resolis "Slope of Light" Guide to a Black Isle Parish' the books subtitle refers to the Gaelic origins of the name of the parish. The guidebook provides an entertaining resource on all things Resolis: education and traditions, estates and tenancies, sins and superstitions. A detailed gazetteer includes all significant historical, natural and architectural features of interest. Published in the Year of Homecoming, with funding support from Resolis Community Council, the Highland Council and the Kirkmichael Trust, all profits will go towards the restoration for community benefit of the historic Kirkmichael site in Resolis. Click on the image to purchase via the Paypal system.